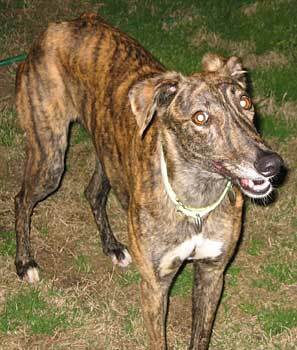 Lacy is a beautiful petite dark-brindle female thought be 2 years old. 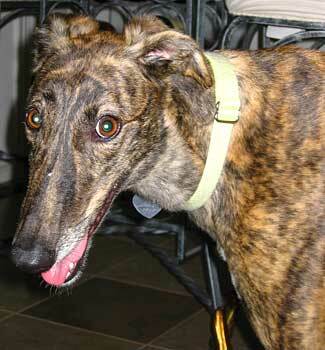 Lacy does not have tattoos, but she came from a racing industry individual who said she was 2 years old. She seems a little shy, but is warming up fast in her foster home. She loves her dog bed, gets along well with other medium sized to large dogs, and already knows stairs! It is not known at this time if Lacy is small animal or cat tolerant. I am the happiest girl in the world. Really I am! When my foster mommy picked me up at the kennel I was a little lost and confused. I had no idea what to expect. Not to mention I was hungry and I wasn't sure how much food I would be getting. Did I mention I was hungry? But not to worry, all my fears were eased very quickly. My foster mommy gave me a lot of attention, hugs and talks, and that was just on the ride home. I guess I have to work on staying in the back of the truck and not keep coming to the front seat. I'll work on that. When we arrived at my new foster home, my foster siblings greeted me with great joy. I wasn't sure what to make of them.....two big dogs and one very small fur ball. I liked them immediately. Of course they had to make sure to tell me who the boss was, and I immediately conceded that I was no boss there. I enjoy being a follower. After filling my belly with lots of good food and treats I was shown to my new living quarters. I had four dog beds to choose from, and that was just downstairs. I felt I was in heaven. I was a little shy at first, but it did not stop me from checking out the new place. I also quickly learned how to use this nifty hole in the door they refer to as a dog door. I could come in and out as I pleased. My foster mommy was thrilled because I learned right away that if I had to potty I used that hole in the door. Shortly after that I sneaked up the stairs....I'm a smart girl so I learned the stairs all on my own. And guess what! I had three doggy beds to choose from upstairs. Well there were really four but one of them is really small...I guess it is for that fur ball, certainly not big enough for me. After the first week with my mommy I behaved so well I was given the privilege of sleeping in the main quarters along with the rest of the group. I was so excited. My foster mommy made it clear, no accidents during the night, no waking up or pacing all night, and I wake up when she wakes up. I passed that with flying colors. Well, maybe I wake up a tad before she does, but she doesn't seem to mind too much. My foster mommy tells me I'm a great girl because I don't counter surf, I am housebroken, I get along with all my buddies, both the big ones and the little fur ball, I don't jump, I only speak if there is something really interesting outside, I don't get on the couch, I listen very well, I learn quickly, and I don't chew on stuff. She also says I'm very pretty and sweet, and most importantly have a very well-balanced personality. She tells me I have to work on not stealing everyone's food and is stubborn about making me eat out of my bowl only. But, but, but....if the food is there someone has to eat it...right! I'm also getting acquainted with these things called 'toys'. I'm not really sure what they do but I will keep you posted when I discover all their uses. As for the crate....I go in there with a little help and if she is really nice and gives me a chew treat, but I'm confident I will not need to be crated much longer if I keep my good behavior up. There is so much I like and so much for me to learn. I'm starting to play with my buddies and enjoy laying in the backyard on nice days. I like most treats but some of them I will have to develop a taste for. I enjoy my short walks in the evening and seeing all the nice people. But mostly I like to just lay down and enjoy the comfort of a home. My foster mommy tells me there are many people who are looking at taking me home with them. I am so excited and will be the happiest girl in the galaxy if my forever home is anything like my foster home. 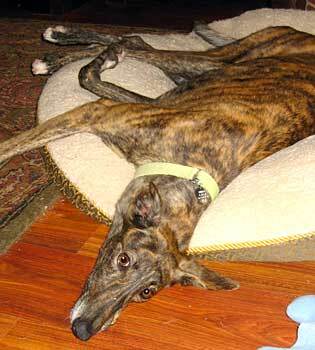 Lacy is a gentle, smart, alert girl. She seems small-animal friendly as she gets along well with my 2 large dogs and my 7 lb little one. She knows how to go up and down the stairs and use the doggie door. She is not too fond of the crate but we are working on it. She sleeps most of the time but enjoys going outside to play or just sniff around the backyard. She keeps to herself for the most part but is showing more interest in toys. Of course, Lacy has already learned what treats are. She hears me getting them from the jar and quickly runs to get hers. She has a very good appetite so I'm sure she will fill out quickly as she is a tad thin. So far Lacy is getting the hang of things and has quickly learned our household schedule.